Observed concentrations of methane in the atmosphere didn’t equal calculations from various sources, like oil and gas wells or tropical microbes. But a new study helps explain the discrepancy. A better calculation of forest fires will help scientists better understand just how much methane is contributing to climate change. Methane levels have shot up since 2006, but scientists for years weren't clear about why. Calculations of methane's various sources didn't match what was observed in the atmosphere. When research teams looked at emissions from the oil and gas industry or microbial emissions in tropical environments, each factor on its own looked like it was enough to account for the atmospheric increase of methane. That changed with a study published Dec. 20 in the journal Nature Communications. 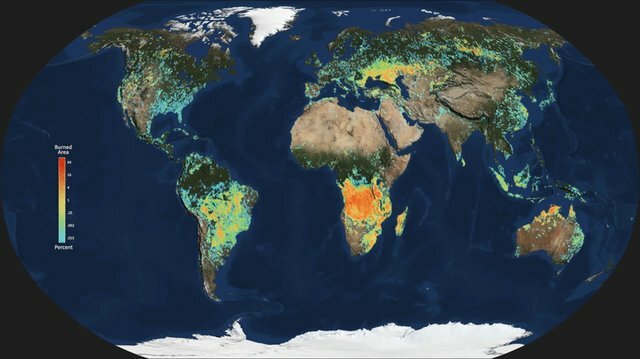 Researchers examined forest fires worldwide because the area burned by these events dropped 12 per cent between the early 2000s and the period 2007-2014, according to satellite measurements from NASA's Moderate Resolution Imaging Spectroradiometer instrument. (The instrument flies with the Aqua and Terra satellites.) Since forest fires are also a source of methane, the scientists supposed forest fires today may be contributing less methane to the atmosphere than in previous years. The research, led by scientist John Worden of NASA's Jet Propulsion Laboratory in California, discovered that methane emissions from forest fires decreased by almost twice as much as previous calculations. This reduction was enough to make the other sources of methane in the atmosphere add up, including the increases observed in both fossil fuels and wetlands. It's tough in most cases to track down exactly how methane molecules in the atmosphere are produced, so the scientists pursued several evidence tracks to make their case. This included measuring other gases, doing chemical analyses, looking at signatures of different types of molecules, and monitoring how land is used. Much of this data came from other instruments on the Aura and Terra satellites. "A fun thing about this study was combining all this different evidence to piece this puzzle together," Worden said in a NASA press release. One key was examining carbon isotopes within methane molecules, which are made up of one carbon atom surrounded by four hydrogen atoms. The scientists found that fire emissions produce the largest percentage of heavy carbon isotopes. Microbial emissions have the smallest percentage of these heavy isotopes, while fossil fuel emissions are in between. The scientists also linked the forest fire-produced methane with carbon monoxide measurements (fires emit carbon monoxide along with methane), as well as atmospheric measurements of another natural gas called ethane. The new methane emission calculations from forest fires perfectly added up with other sources of methane to match the observed increase of this molecule in the atmosphere. Atmospheric methane concentrations are measured in teragrams. Each teragram equals 110,000 tons, or the approximate weight of 17,000 elephants. "Combining isotopic evidence from ground surface measurements with the newly calculated fire emissions, the team showed that about 17 teragrams per year of the increase is due to fossil fuels, another 12 is from wetlands or rice farming, while fires are decreasing by about 4 teragrams per year. The three numbers combine to 25 teragrams a year — the same as the observed increase," NASA said. The first survey on how humans influence climate change took place in 1971, and stated that "methane has no direct effects on the climate or the biosphere [and] it is considered to be of no importance," according to NASA's Goddard Institute for Space Studies. But in the decades since, climatologists discovered that methane actually is of great importance. In 1976, a study led by Wei-Chyung Wang found that methane is indeed an important greenhouse gas and absorbs infrared heat radiation from Earth's surface, which contributes to warming the climate. Separate studies of ice cores in Greenland and the Antarctic showed that methane concentrations in the atmosphere are twice as much today as they were 150 years ago. "The changes over the last century seem to be mostly related to increased emissions due to human activity: leaks from mining and natural gas pipelines, landfills, increased irrigation (particularly rice paddies, which are essentially artificial wetlands) and increased livestock producing more intestinal CH4 among other factors," according to the Goddard Institute. "Atmospheric detergent" molecules such as hydroxyl radicals (OH) — which remove methane and other hydrocarbon chemical species from the atmosphere — become less efficient as the atmosphere warms. This allows methane and other greenhouse gases to stick around longer and continue warming the Earth. The warming climate is producing many effects on the environment, including reducing sea and land ice, raising sea levels, and causing more frequent and more intense extreme weather events, like droughts and heavy downpours. Annual average temperatures over the contiguous United States have increased by 1.8 degrees Fahrenheit (1.0 degree Celsius) since the beginning of the 20th century, according to the latest National Climate Assessment. By mid-century, temperatures are expected to rise 2.5°F for the United States. There is “no convincing alternative explanation” to human-caused climate change, the report says.